Here is a letter dated November 14, 2015 sent by the SSPX French District to its priests regarding the Jubilee Year of Mercy. Now, allegedly, Menzingen has sent the same letter to all priests of the SSPX. If anybody could translate the letter into English, it would be greatly appreciated. I highly recommend listening to this interview. It is very good. Please in your charity pray for the repose of the soul of Santiago Hernandez, son of Paul Hernandez of the Our Lady of Mount Carmel Seminary in Boston, Kentucky. Santiago passed away earlier today. Ambrose Moran: Is He Really a Catholic Bishop? On September 25, 2015 there was an interview published that was conducted by Fr. David Hewko of Bishop Ambrose Moran in which Bishop Ambrose Moran presented himself as a Catholic bishop. On November 3, 2015 Fr. Joseph Pfeiffer gave a conference to his seminarians regarding Bishop Ambrose Moran. An audio recording of this conference was published on November 9, 2015 by the author of Third Days in the Boston Seminary blog. In this conference, Fr. Pfeiffer promoted Bishop Ambrose Moran as a Catholic bishop and gave a timeline of events explaining why he believed this to be true. Fr. Hewko was also present at the conference and seemed to agree with Fr. Pfeiffer. It must be noted that Fr. Pfeiffer did not intend to have this conference made public. The author of the blog, however, acted in good faith at the time thinking that it was okay to do so. The next day, November 10, the author of the blog removed the recording at my request. On November 6, 2015 Fr. Hewko sent Fr. Francois Chazal a summarized history of the life of Bishop Ambrose Moran. This history was presented as factual. Fr. Chazal’s response to the summarized history was published here. The summarized history matches what Fr. Pfeiffer revealed in his November 3, 2015 conference. The Fathers did not give reasons as to why they had decided not to associate with Bishop Ambrose Moran after having publicly and privately promoted him as a Catholic bishop. For those who did not believe in Bishop Ambrose Moran’s claim, this came as a pleasant surprise. However, it left many scratching their heads as to why there was a sudden turnaround. It was like having chocolate cake that contained no sugar. On November 15, 2015 Fr. Hewko gave a sermon in which he stated that the Our Lady of Mount Carmel Seminary would not associate with Bishop Ambrose Moran, thereby re-iterating the November 7 statement. I thank Fr. Hewko for admitting that at least for him the Bishop Ambrose Moran situation was a confusing ball of wax. Fr. Hewko had decided on the morally correct course of action after considering more information: when being in doubt, do not act. I also thank Fr. Hewko for apologizing for the unintentional scandal caused to the faithful. It took much humility and courage on his part. In this sermon, Fr. Hewko seems to have had his mind been placed in doubt as to whether Bishop Ambrose Moran was consecrated a Catholic bishop. The question remains, however, what is Fr. Pfeiffer’s current position regarding whether Bishop Ambrose Moran was consecrated a Catholic bishop? I was hoping that a sermon or statement would have been published last week regarding this, but that did not happen. After all, Fr. Pfeiffer is the rector of the seminary and as such the firmness of the November 7 statement will depend more on Fr. Pfeiffer’s position and his certitude of that position than that of Fr. Hewko. Therefore, I hope that Fr. Pfeiffer will make public his current position regarding whether Bishop Ambrose Moran was consecrated a Catholic bishop. To be honest, I hope very much that both Fr. Pfeiffer and Fr. Hewko come to the conclusion (as I have), with a prudential certitude (moral certitude in the wide sense), that Bishop Ambrose Moran was not consecrated a bishop by Cardinal Josyf Slipyj, but that he was consecrated a bishop by schismatics. Please note that I do not vouch for the validity of the Bishop Ambrose Moran’s consecration as I do not know enough about the schismatic Orthodox and their episcopal lineage. I only call him “Bishop” Ambrose Moran because he was consecrated to be such amongst the schismatic Orthodox. I have already provided evidence here and here that Bishop Ambrose Moran was not consecrated a Catholic bishop; rather, he was consecrated a bishop by schismatics. It is the object of this article to provide further evidence supporting my claim. The picture below (ignore the yellow and orange highlighted areas) is a screenshot that I took on October 5, 2015 of a website under the url “www.theuoac.com”. On October 14, 2015 I called Bryan Jordan, website registrant contact as indicated in the second screenshot below, to find out why the website contained information that was contrary to Bishop Ambrose Moran’s claim of being a Catholic bishop. 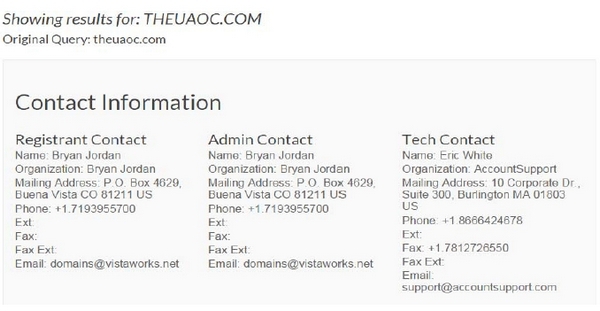 A lady, who worked at the website hosting company called “VistaWorks“, answered the phone and told me that Bryan Jordan worked for VistaWorks. He was not the owner of the website. She also told me that someone had called that same morning and the website was taken down. At that time, I did not know who owned the website, but I had a suspicion that it was owned by Bishop Ambrose Moran himself. This suspicion was based on the information contained on the website and the registrant mailing address, Buena Vista, Colorado. Bishop Ambrose Moran lives in the area. A couple of weeks later I found out, from a very reliable source, that Bishop Ambrose Moran did indeed own the website and that he took it down. The screenshot below of the now taken down website will be analyzed in light of the information provided by Fr. Pfeiffer in his November 3, 2015 conference to the seminarians, that is, that Bishop Hryhory (Gregory) Ohiychuk, presiding consecrator of Bishop Ambrose Moran, and the Ukrainian Autocephalous Orthodox Church in the USA-Sobornopravna (UAOC-USA) and Holy Protection Cathedral in Chicago, Illinois founded by him while he was a schismatic Orthodox became Catholic under Cardinal Josyf Slipyj in the early 1970s and remained Catholic until his death in 1985. Therefore, Bishop Hryhory was Catholic in 1976 when he consecrated Bishop Ambrose Moran. After Bishop Hryhory’s death, the Ukrainian Autocephalous Orthodox Church in the USA-Sobornopravna and the Holy Protection Cathedral reverted to being schismatic Orthodox. Because of this reverting back to being schismatic Orthodox, Bishop Ambrose Moran would no longer associate himself with them. Fr. Pfeiffer also told the seminarians that in 1983 there was an attempt to unite schismatic Orthodox branches under Rome. The problem was that a Bishop Mstyslav Skrypnyk, who was part of the unification attempt, wanted to replace Cardinal Josyf Slipyj as the leader of the Ukrainian Catholic Church. The unification attempt subsequently broke apart, but Bishop Hryhory remained Catholic. Now let us move on to analyze the information contained on the website owned by Bishop Ambrose Moran himself and taken down by him on October 14, 2015. I have marked numbers on the screenshot to indicate the sections I am referring to. Each of the following points found on the website oppose the narrative given by Bishop Ambrose Moran to Fr. Pfeiffer. 1. Bishop Hryorij established the UAOC-USA in Chicago in 1952. The current primate is Metropolitan-Archbishop Ambrose Moran. According to Bishop Ambrose Moran’s narrative to Fr. Pfeiffer, he did not take over the UAOC-USA after Bishop Hryhorij’s death in 1985. 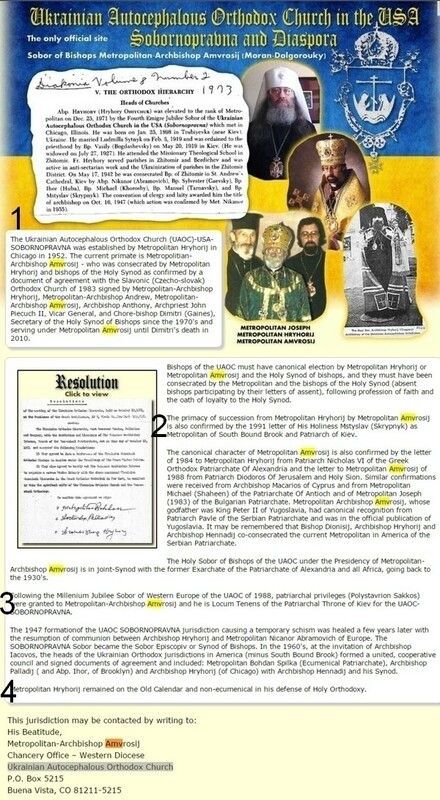 If one objects that “current” does not necessarily indicate past 1985, it does not fly because, first of all, Bishop Ambrose Moran does not claim to have been primate while Bishop Hryhorij was alive and, secondly, in the same section in the screenshot there is mention of a Dimtri Gaines serving under Metropolitan-Archbishop Ambrose Moran in the UAOC-USA until 2010. Regarding the claim that Bishop Hryorij, UAOC-USA, and the Holy Protection Cathedral became Catholic in the early 1970s, I challenge anybody to find even one reliable source that claims any one of them were ever Catholic. 2. The primacy of succession from Metropolitan Hryhorij to Metropolitan Ambrose Moran was confirmed in a 1991 letter of His Holiness Mstyslav Skrypnyk. Bishop Mstyslav Skrypnyk is the same person that Bishop Ambrose Moran told Fr. Pfeiffer wanted to be leader of the Ukrainian Catholic Church and subsequently broke the attempt at unification under Rome. Yet we have here Bishop Ambrose Moran calling Mstyslav “His Holiness” and using Mstyslav’s 1991 letter, six years after Ambrose Moran had supposedly left the UAOC-USA, to vouch for the validity of his being the legitimate successor to Metropolitan Hryhorij. 3. Patriarchal privileges were granted to Metropolitan-Archbishop Ambrose Moran following a sobor (council of bishops) of Western Europe of the UAOC in 1988. These patriarchal privileges were not granted by Pope John Paul II, who appointed Myroslav Ivan Lubachivsky in 1984 as successor to Cardinal Josyf Slipyj. Furthermore, Pope John Paul II only granted Myroslav the title of Major Archbishop. Also, note that there is not one mention of Cardinal Josyf Slipyj, who Ambrose Moran claims consecrated him in addition to Bishop Hryjorij, anywhere on Bishop Ambrose Moran’s website. 4. Metropolitan Hryhorij remained on the Old Calendar (Julian) and non-ecumenical in his defense of Holy Orthodoxy. “Holy Orthodoxy” is a term used by the schismatic Orthodox. These points should be more than sufficient to demonstrate that this website belongs to a schismatic Orthodox bishop and runs contrary to statements made by Bishop Ambrose Moran to Fr. Pfeiffer. This article continues after the two screenshots. In addition to what is presented above, I have communicated with three high ranking clerics of two branches of the Ukrainian Orthodox Church regarding whether Bishop Hryhorij and the Holy Protection Cathedral were ever Catholic. This is the same cleric Fr. Pfeiffer visited at the Holy Protection Cathedral in Chicago, Illinois on October 27, 2015. I had a few phone conversations with him regarding Bishop Ambrose Moran. He confirmed to me that the consecration of Bishop Ambrose Moran did indeed take place at the Holy Protection Cathedral. Prior to giving me confirmation, he contacted Bishop Ambrose Moran directly via phone to ask him some questions in order to prove his identity and was satisfied with the answers. My last phone conversation with this cleric was on October 31, 2015. I specifically asked him on this occasion whether Bishop Hryhorij and the Holy Protection Cathedral were ever Catholic; he responded in the negative. Fr. Poliarny is currently the highest ranking cleric of the Ukrainian Orthodox Church-KP within the United States and Canada and as such has jurisdiction over Cleric #1 of the KP and the Holy Protection Cathedral. He reports to the KP’s patriarch, Filaret. He moved to Chicago in 1959. He knew Bishop Hryhorij. Fr. Poliarny has given me permission to use his name publicly. I spoke to him over the phone on November 13, 2015. Fr. Poliarny adamantly denied the claims that Bishop Hryhoriy ever became Catholic and that the Holy Protection Cathedral was ever under the control of the Catholic Church. He said that they were both always Orthodox. Given all this evidence (including the two posts here and here), as I said above, I hope very much that both Fr. Pfeiffer and Fr. Hewko come to the conclusion, with a prudential certitude, that Bishop Ambrose Moran was not consecrated a bishop by Cardinal Josyf Slipyj, but that he was consecrated a bishop by schismatics. Only with this certitude in their minds, we can at that time rest assured that the Our Lady of Mount Carmel Seminary’s bridge with Bishop Ambrose Moran has been burned.